I'm excited that I can team up with Tropical Traditions again and this time with another one of their absolutely amazing natural organic products! I was able to try their yummy Organic Coconut Peanut Butter! Oh my, what a treat! The coconut was not overwhelming at all, but rather subtle! It had a distinct natural sweetness to it that could actually be compared to a light honey-like taste. I think it tastes absolutely amazing, not to mention that there are no waxes, trans fats or rancid peanuts! I was very surprised to learn that Tropical Traditions has more than one kind of peanut butter! They have the most varied list of gourmet, organic peanut butters that I have ever seen! Have you ever thought of different kinds of peanut butter? I hadn't until I saw their extensive list! They have 11 different flavors of peanut butter! I would love to try all of these flavors! Now that I've tried and love the Coconut Peanut Butter, what else would be good? The possibilities are endless! Get it: You can buy directly from Tropical Traditions website. There is a great sale for their Virgin Coconut Oil! Buy one and get the 2nd free! And you can get their organic lip moisturizers for the same deal - buy one and get the 2nd free! Tropical Traditions also has a Referral Program, so if you place an order with them as a first-time customer, you can select “Referred by a friend” and in the box that says “How did you hear of us?” enter this sponsor ID # - 5954910. You will receive a complimentary copy of the book Virgin Coconut Oil: How it has changed people’s lives and how it can change yours! by Brian and Marianita Shilhavy with your first order! This book is filled with testimonies and research showing how healthy coconut oil is, and it also includes over 85 recipes showing how one can incorporate coconut into their diet! Win it: For your own jar of Tropical Traditions Organic Coconut Peanut Butter, please complete the mandy (mandatory entry) and any of the following entries for extra chances to win! Please make your e-mail address available so I can contact you if you win!!! Mandy: Visit Tropical Traditions and tell me another kind of peanut butter that you'd like to try! Become a Facebook Fan of Tropical Traditions! Come back and leave your follower first name and last initial! Subscribe to AGalNeeds....RSS Feed (on right sidebar) using Google or another method that you prefer! Follow this blog on Google Friend Connect! Tweet daily for an extra entry every day! Leave me your twitter status in your comment! 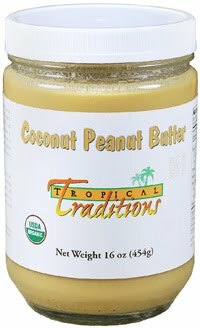 You can copy and paste this: "AGalNeeds...a jar of organic coconut peanut butter from @TropTraditions http://helena-agalneedsatleast2blogs.blogspot.com/ 4/29/10. This giveaway will end on 4/29/10 at 12:00 am MST. I am excited that one of you will get this wonderful gift! Thanks to Tropical Tradition for their help and generosity. Winner will be chosen with Random.org and will be notified by e-mail. Contest is open to both US and Canada. However, Tropical Traditions is not responsible for customs or duties that Canada may charge if you decide to participate in this Tropical Traditions sponsored blog giveaway! The opinions expressed in this blog are mine and were not influenced in any way by Tropical Traditions or any other outside party. The winner was #8, picked by Random.org number generator! Congratulations! I would try the Dark Chocolate Peanu Butter! I'd love to try their Organic Dark Chocolate Peanut Butter. I would love to try their Organic Dark Chocolate Peanut Butter! I am a facebook fan of tropical traditions, Nurinia M.
I follow tropical traditions on twitter. @daer0n. Naturally sweet Organic Valencia peanuts and nothing else! Peanut Butter! Hope I win! Really want to try the Coconut!! I'd like to try their Thai Ginger. It would be great in peanut dipping sauces for spring rolls! Oh my goodness - the dark chocolate peanut butter sounds so good! I'd like to try the Organic Dark Chocolate Peanut Butter. I had no idea that Tropical Traditions had other kinds of peanut butter besides the coconut. I'd love to try the dark chocolate! Fan of Tropical Traditions on Facebook. Angela B. D.
Sounds great for stir-fry with peanut sauce. I would go for the organic creamy peanut butter- old fashioned that way! I would like to try the Dark Chocolate Peanut Butter. I am a fan of TT on Facebook. Juanita D.
Hi! I'm a fan of TT on Facebook! My name is Lisa T.
I would love to try the Dark Chocolate Peanu Butter! Peanut Butter sounds so good!! oh the organic cinnamon peanut butter looks like to would taste great! I'd like to try the Hickory Smoked. I'd like to try the cinnamon and the dark chocolate. Facebook Fan of Tropical Traditions - dina n..
Wow! There are so many yummy choices. The Thai Ginger and Red Pepper flavor sounds really good - - would be great for a sauce or salad dressing. I follow Tropical Traditions on Twitter: @talynma. I follow you on Twitter: @talynma. Now the vanilla cranberry peanut butter sounds divine. But hickory smoke peanut butter sounds just as interesting. The dark chocolate peanut butter sounds soooo good. Thanks! The Chocolate sounds so good and the Cranberry might be good too. Not to sure about the other flavors, but if they had a sample set I would buy it just to try all the flavors. I would love to try the Organic Dark Chocolate PB! I'd love to try the vanilla cranberry flavor. or the coconut of course!